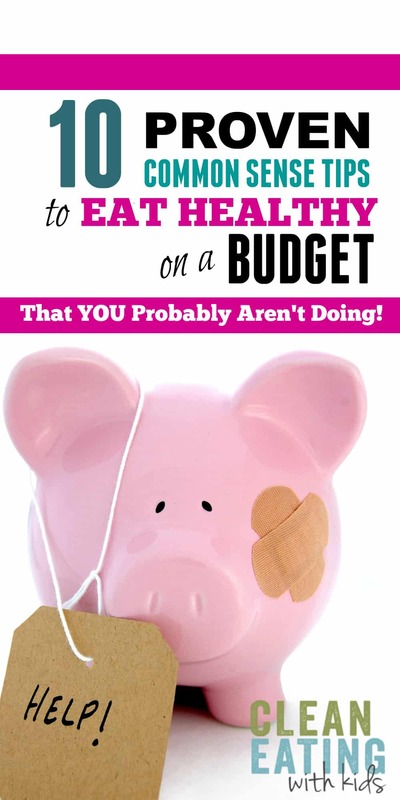 You are here: Home / Money / 10 COMMON SENSE Tips to EAT HEALTHY on One Income. 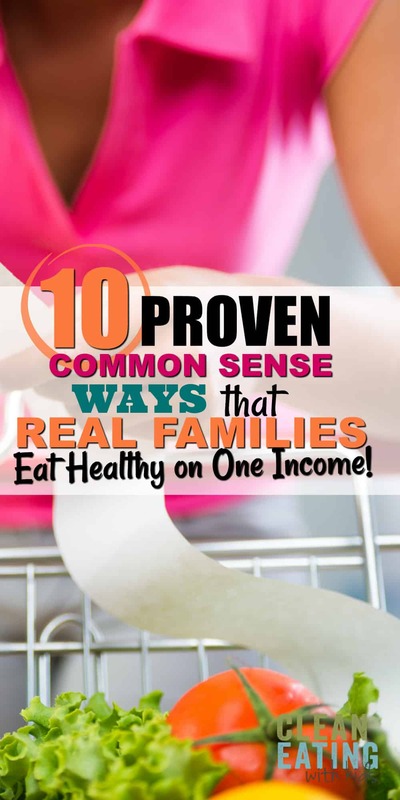 10 COMMON SENSE Tips to EAT HEALTHY on One Income. August 3, 2017 This post may contain affiliate links. Up until recently, our grocery bill nearly overtook our mortgage repayments. We were literally eating into our income every month. With four kids and a single income, this was tough. But not anymore. With a few little tweaks (and one major change) we managed to cut $7,200 this year from our grocery spend alone. Five years ago before our family started on a Real Food lifestyle, my homemaking skills were a hot mess. I would go grocery shopping two to three times a week and fill my trolley without a plan. Literally grabbing any item off the shelves that was on special or looked like a fast food option. I was a food marketers ideal Shopper. I fell for everything! And I was paying for it too. Food would sit in my fridge and go bad. There were even items in my pantry gathering dust that dated back three years. I never knew what to make for dinner so we would get takeout at least once or twice a week – while the food was rotting in the fridge and I was stressing about where all our money went! The kids were growing along with the grocery budget and things were getting real tight on a single income. It’s only when I sat down and did our first ever household budget that I realized how much I was wasting on groceries. I was embarrassed and shocked! I knew that I was the one responsible for throwing away a big portion of our hard earned cash. I knew that I needed to make some changes immediately. To be honest, I wasn’t actually sure where to start. In the beginning I just stopped buying a lot of things to try and make the budget cut. My fridge and pantry looked (and was) empty, kids were always moaning about being hungry and I was still stuck on what to make for dinner. I ended up making more trips to the grocery store during the week and my spending crept up again. I felt like a failure. I couldn’t even manage my own household. By implementing a few little strategies we managed to cut over $7,000 from our grocery spend in the first year – $7,230 actually compared to the year before – and make the change to clean eating at the same time. The funny thing is it wasn’t even that hard. I wish I had started doing this years ago! Meal planning is by far the number one skill you need to Master when you begin your grocery budget makeover. I avoided meal planning for years. It sounded daunting and time consuming and I thought it was a little silly. I imagined it involved binders, spread sheets and walking around the shopping centre with a notepad and calculator! Thank goodness I didn’t let my imagination get the better of me. A weekly 10 minutes of Meal Planning has saved my thousands of $$$. Did you know that, according to a study done by the Natural Resources Defense Council, the average American family wastes $2,200 on food a year. $2,200!! A Year! Our family was the no different. We would clean out the fridge once a week and throw things away that we hadn’t used. All this waste could have been avoided if a I had a meal plan in place rather than just buying random items at the supermarket that would just sit rotting in the fridge. It doesn’t have to be complicated. Meal Planning takes me about 5 – 10 minutes a week. And another benefit about it (aside from saving money part) is that the pantry is never empty so you are never left wondering what to make for dinner plus you save even more by avoiding those last minute take out dinners (I worked this out to be $720 I did NOT spend in the last three months). So whether you want to increase your income, get out of debt, or just some simple saving tips,I've got you covered! CHOOSE 7 DINNERS: Start by making a list of seven dinners you will be making this week. Check your pantry and fridge to see what ingredients you already have and make a list of the ingredients you need to buy. CHOOSE 3 BREAKFASTS: Decide on Three breakfast choices to rotate during the week. In our home this is normally Wholewheat toast & eggs, Oats and Homemade granola in Winter and Yogurt, Fruit & Granola in Summer. EASY LUNCHES: Keep lunches simple. Make a little more at dinner so you can add to lunchboxes the next day or stick to an easy lunchbox formula: Sandwich, fruit/veg or salad and a baked good of some kind (muffins are a hit at our place). You don’t need to build an underground bunker or stock up for a Zombie apocalypse here. I’m just talking about having a well stocked pantry where there is always a meal available. You can build this up slowly. Aim to always have at least 3 – 4 days of meals in your stockpile. When one of our regular ingredients are on special, I buy extra to add to my pantry stockpile. This saves me money in the long term and also ensures we won’t run out of food. I learned the importance of stockpiling the hard way. One year we were stuck in the middle of a 40 year flood. We were stranded in our home for three days and we ran out of everything (including toilet paper). Oh, and don’t buy crappy food just because it’s cheap. It will sit in your pantry and you will end up throwing it out. Only buy food that you would eat normally. Canned tomatoes. These are a must have in any clean eating pantry and can be used as a base for most casseroles, soups, gravy. pizza topping and pasta sauce. Grains, pasta, Beans, Seeds. Wholewheat Flour, Almond flour, Dried beans, lentils, dried pasta, cous cous, rice and nuts. Sweeteners. Honey, Raw Sugar, Maple Syrup. Other pantry items: peanut butter, herbs and spices, cocoa, organic pasta sauce, olive oil. Stock Up: If beans are on special. Buy them in bulk, clean and prepare them and freeze them. Same goes for most seasonal vegetables. If you can find it in the frozen food section in the Supermarket, then there is no reason you can’t freeze your own. Leftover sauces, dairy, vegetables and meat can all be safely frozen for months. Make your own ready to eat meals: Double up on freezer meals like bolognaise sauce, soups and casseroles. Freeze fruit before it goes bad for smoothies. Check out my Pinterest Board: Healthy Freezer Meals for some meal freezing inspiration. 3. Buy and Eat Seasonal. Seasonal produce are usually available in abundance so this means that they are cheap and readily available. Be creative and see how many recipes you can come up with using whatever is on special. Buy in bulk and freeze for future meals. Buying a whole chicken is a lot cheaper than buying chicken pieces and you can use it make at least two meals. When we make a roast chicken, I put the chicken carcass into a large pot, throw in some veggies and make chicken stock for my next soup or casserole. 5. Plant a Veggie Garden. OK, so not all of us has a talent in this area. I have tried (and failed) countless times to get a good veggie patch growing, but I have mastered growing herbs. Mint, parsley, coriander and thyme grow in my flower beds or add them to pots on the porch. 6. Package your own food. Buy in bulk and package your own food into portion sizes. My grandmother was a pro at this. She would have all of the Grand kids lined up shelling peas and bagging them. I don\’t know how she managed it, but I swear we had so much fun doing it that we didn’t even know that it was chore. 7. Bulk up meals with vegetables. Two Chicken breasts between a family of six? Not a problem. Add them to yummy chicken casserole with plenty of veg and a bed of brown rice. Use budget friendly ingredients like vegetables, beans and grains to bulk up almost any meal. 8. Keep a Recipe Binder. When you find a budget recipe that your family loves to eat, print it out and keep it. I have a recipe binder full of recipes I have made and discovered over the years that I keep in my recipe binder. One day I hope to copy it four times and hand out to each of my children when they head out on their own. It is a legacy of their childhood. Well, that’s what I tell them anyway. 9. Double up on Meals. Some meals are easy to double up on. Eat one now and freeze the other for later. It saves time and money and sanity. 10. Save Money on Meat. Cheaper cuts of meat make the tastiest casseroles, curries and soups, so don’t feel guilty when your family doesn’t dine on choice cuts. Seriously, you run a home, not a restaurant. Or consider implementing a Meatless Monday strategy and skip the meat all together on Monday nights. Make a macaroni and cheese, vegetarian lasagna or an amazing salad. So there you have it. some of the ways we save money on groceries and Eat Clean at the same time. Just by implementing these little tips, we have cut down on food waste, saved money on takeout and managed to cut $7,000 off our annual grocery bill this past year. I’d love to hear how much you’ve saved on food and what helps you save money on your grocery bill. Let me know!